The friend of the painter, Abraham Ortelius wrote: “In all of Bruegel’s work lies more than shown.” In the picture there are the distant mountains and the sea harbor with boats, river and pond, town, castle and village huts, trees and hills. With the medieval passion for lists Bruegel visual lists of animals, birds, human, as well as settlers and their vicissitudes of life: the return from the hunt, play on the ice, busy with seasonal and casual work, fire fighting … But all of these animals, people and their activities have not only signs of life calendar – the XVI century artist puts sense into this harmonious universe of new Renaissance. 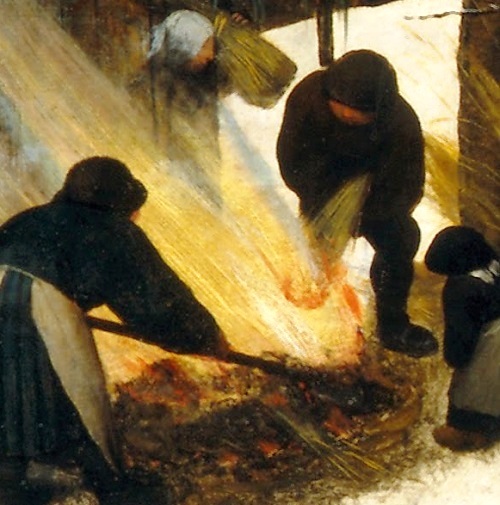 Bruegel shows people with their life in a generalized image of a beautiful world as an important and inseparable component of it. 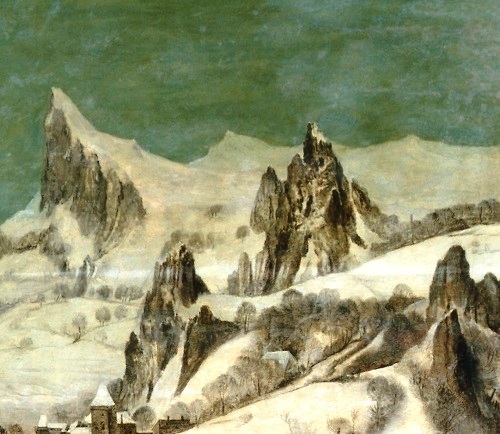 Art critic Otto Benesch considered that this reflected in the art of the Northern Renaissance pantheistic ideas of Renaissance philosophers: God does not look at the earth from the distant heavens, and is in every part of a single universal mechanism. (1) Fox. With dogs and spears could hunt not only for paultry, but also deer, wild boar or bear, but this time catchers have poor prey. 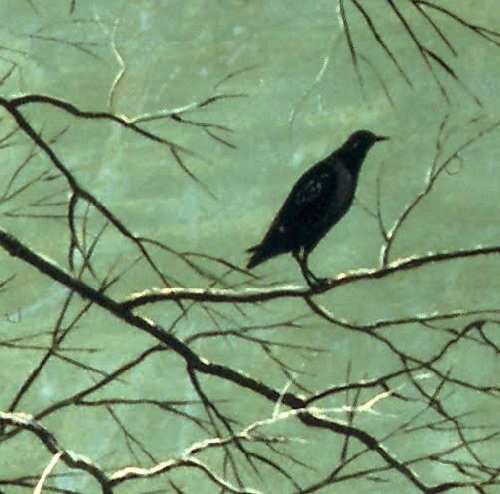 Hunt in medieval visual arts often associated with December and January. (2) Fire. The villagers built a fire to smoke the pig carcass. 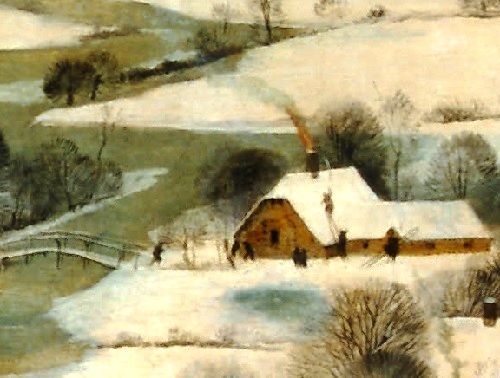 This activity is in line with traditional work in December. In November, pigs fattened and in December were slaughtered for harvested meat. (3) Sign. The hotel is called Dit is inden Hert (The deer). The sign is painted, an animal and holy in front of him on his knees, probably, Saint Eustace Placidus or Hubertus, patron of hunters. According to legend, Eustace was a Roman military leader. One day while hunting he chased a deer, but he saw between the horns of an animal glowing cross with a crucifix. Hunter fell to his knees and turned to the Christian faith. The same vision visited Hubert. He, being a bishop, was hunting on Good Friday: the vision repented sinner, and he repented of levity, from that day became a model Christian. (4) Magpie. In the European tradition, this bird is considered to be talkative and roguish. 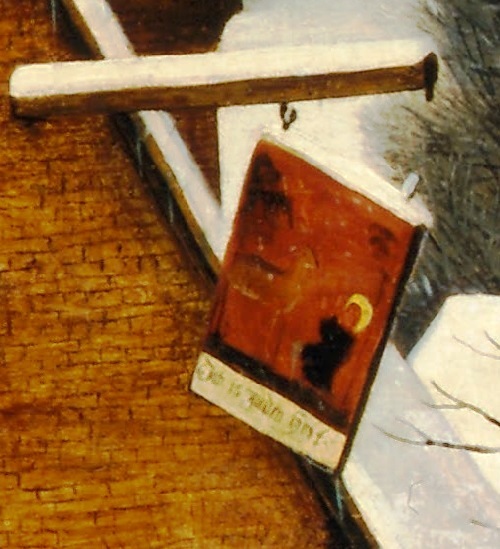 Willing to wife his last painting “Magpie on the gallows,” Bruegel not coincidencely hinted at some “gossip”, by which he once was hurt. 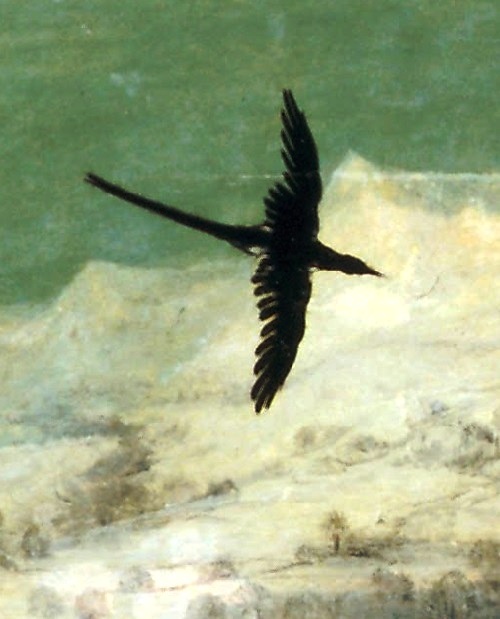 But in “Hunter …” deprived satirical subtext, Magpie, like crows in a tree, probably just birds wintering in the Netherlands. (5) Skates. 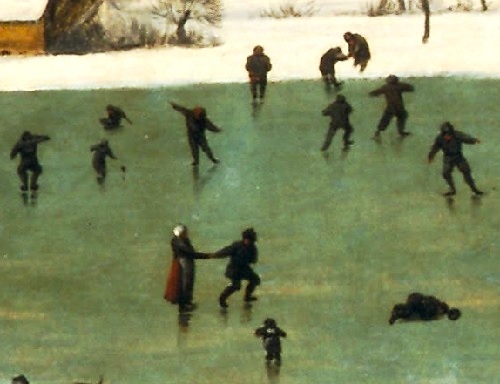 Popular activities in the Netherlands of Renaissance. In medieval Europe, skates were mainly made from animal bones. The Dutch are credited with improving the skates in the XIV century to the block of wood, tied to a shoe with leather straps, steel fasten the bottom strip of metal to better gliding. By 1500, it turned into a sharp metal blade – so there was the prototype of the modern design of the skate. 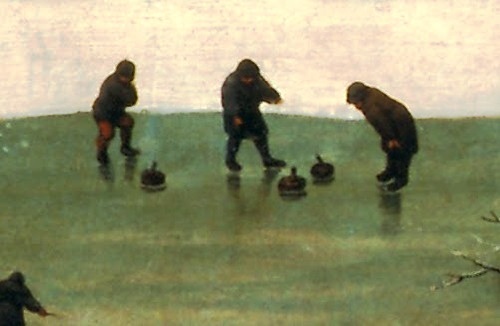 (6) Curling. 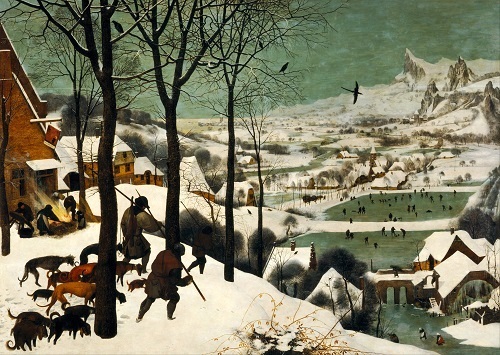 Bruegel’s paintings on the theme of winter are the first known images of this like a curling game. It is still popular in Austria and Germany. (7) Playing with a ball and clubs. 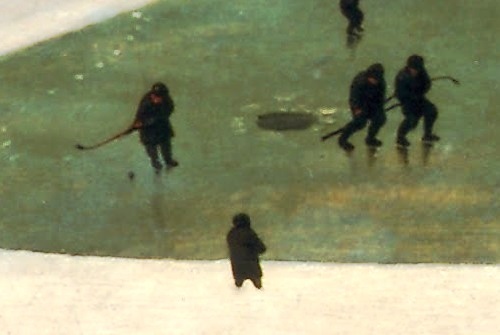 Forerunner of ice-hockey was common in different countries of medieval Europe in the winter and in the summer version. 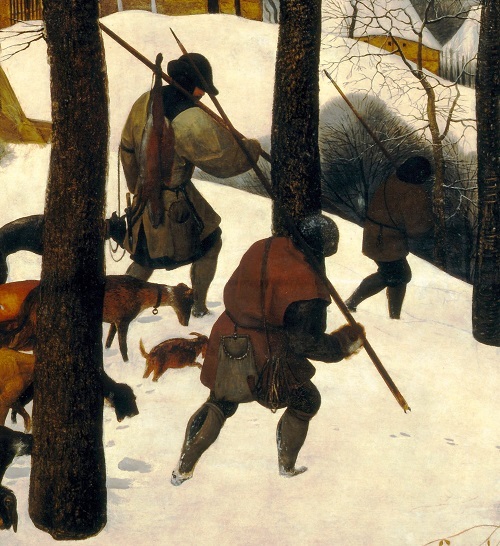 Children in the picture probably enjoy Dutch winter game Colva. Its principle was to push the ball with a stick of wood or leather, to get to the target. (8) Village. 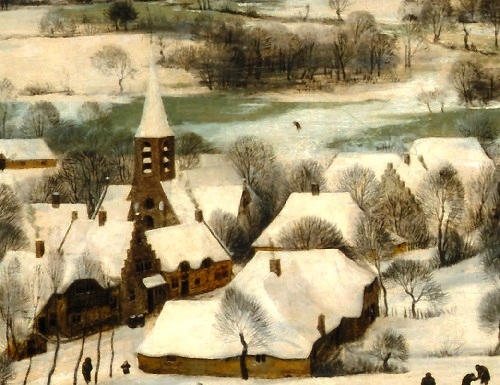 Such houses and churches with bell towers are characteristic of any village of Renaissance Netherlands, and the area from which Bruegel painted the landscape has not been established. Most likely, this is a generalized image of the rural districts.